Being new here, it seems I’m constantly surprised living in Nashville. Once I made a comment I wouldn’t be surprised if I walked into a Waffle House and found a stage and mic stand. It seems I spoke too soon. On Saturday, I walked into McDonald’s, and noticed call letters next to the McDonald’s logo. When I entered the establishment I saw to my left a stage, mic stand, and you guessed it, someone singing their heart out. His name is Ron Crites and he is extremely talented, and has opened for George Jones, Brad Paisley, Roy Clark, and many others. Truly a talented singer/songwriter, Ron markets himself as a “Country Variety Music Acoustic Solo Artist.” His new album is a tribute to George Jones. 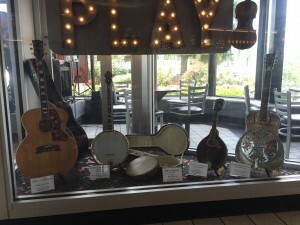 Later after talking to a McDonald’s employee, I found out the reason for the mini museum within McDonald’s as it is the site of radio station WMAC of Nashville. I believe my Saturdays will be at McDonald’s from now on, hopefully seeing Ron and his one man band. Hello I have just found this on the web and wanted to thank you for such a great review. I remember talking to you and you telling me that you were going to do this. You might of sent me an e-mail about this but I must of missed it. We just returned from Nashville and must say Ron is probably the hardest working and nicest person we met during our visit. We 1st see Ron performing at the George Jones museum downtown. The next night we were surprised to see Ron guest appearing at The Nashville Palace 20 miles away near Opryland. His 3 song set literally had Jan crying when he played “he stopped loving her today” as it reminded her of her deceased father. 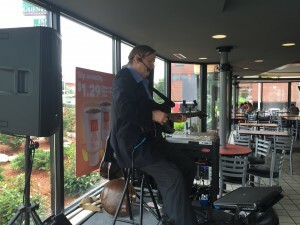 Finally, the next morning, we run into Ron at the McDonalds where he was playing a morning show. We thanked Ron for his prior shows and he graciously gives us a copy of his George jones tribute CD. Hats off to Ron and his music!!! Thank you for your comments. Ron is a class act. I also met Ron while visiting Nashville. Meeting Ron and enjoying his love for George was the highlight of my trip! Ron keep the spirit going and continue to touch the lives of people like me who are so lucky to cross paths with you. Ron Crites is a wonderful performer simply the Best!!! Just saw Ron in Concert at the Rockin’ Round Up in Waterford Michigan. He put on terrific concert that was well worth the admission price. Ron is a class act.